We’ve all been to tab hell. Maybe you spent hours falling down a Wikipedia-fuelled research hole, maybe you were just binging on “Game of Thrones” content. Whatever the case, you found yourself staring at a couple dozen tabs, unsure of what it was you were trying to do in the first place. More annoyingly, you also started to feel your laptop getting sluggish. Especially with a memory hog like Google Chrome, keeping that web of tabs open can chew up resources that your notebook might not have to spare. Fortunately, there are ways to organise your clutter that don’t involve closing your window completely. OneTab. 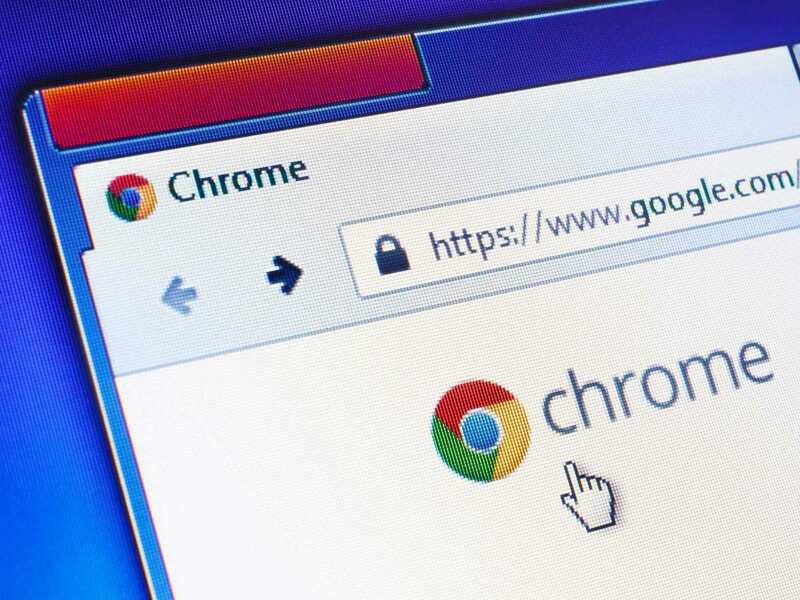 It’s a free Chrome (and Firefox) extension that’s earned praise for a few years now, but still makes the process of handling numerous tabs much more convenient. Using it is simple. Once it’s downloaded, all you do is click the little icon to the right of the address bar. Then, OneTab will quickly collapse whatever you have open into a tidy list of links in its own tab. When you want to open a particular page back up, just click the appropriate link. If you’re done with one, just X it off the list. Both the mess and the memory usage get reduced. That alone is pretty useful, but OneTab becomes particularly handy if you want to share those tabs somewhere else. For instance, when I’m researching an article, often times I’ll manually copy and paste any relevant links into an Evernote note. This takes too long. 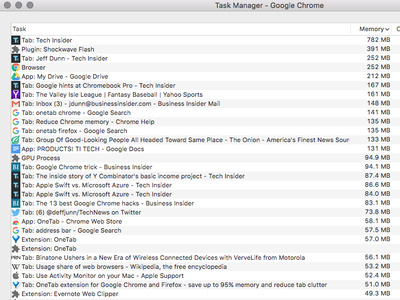 With OneTab, though, I can create a single shortcut to that list of links in one fell swoop. It’s a similar deal if you wanted to, say, email a list of real estate listings to a house-hunting friend. 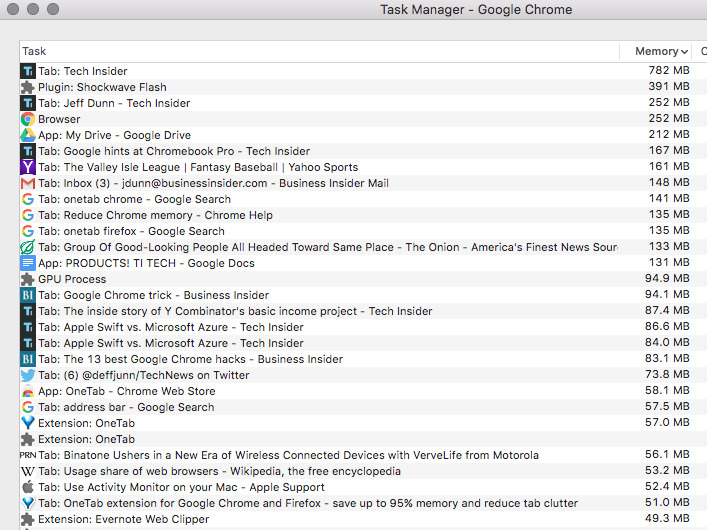 Tech Insider/Jeff DunnMy tabs’ memory usage before using OneTab. Tech Insider/Jeff DunnWhat things looked like after using OneTab. Beyond that, you can name certain groupings of tabs to better separate them, choose whether or not you want to collapse pinned tabs, and make it so only certain tabs get sent to OneTab at once. It’s all fairly well-thought-out. The only real downsides are that: 1. Re-opening a tab doesn’t bring back that tab’s browsing history, and 2. Chrome already has a built-in “Bookmark Open Tabs” option that can be used fairly similarly. Something like OneTab is a little more streamlined than that, though — nobody wants to go back and delete folders of permanent bookmarks. Either way, if Chrome’s been beating down your laptop too often for comfort, a tool like this might be able to help.